The Resident Tourist: To Tao or Not to Tao . . . I may have written about this before, but my mom and I have a little tradition after my doctors appointments: we go to Tao on 58th for Lychee Martinis and Spicy Tuna on Crispy Rice. We've been doing it for almost three years now. I don't remember how it started (and I realize how weird and random the restaurant choice is), but it's become the perfect little ritual - the drinks and food are tasty and at the hour that we go (6pm on a week night, hah) the place is quite and pleasant, nothing like the crazy club scene it turns into after hours and on weekends. Last night after my doctor's visit, we did as we always do. And as usual, I thought it was a great. This morning on my way to work I was reading through the latest restaurant reviews and came across this terrible review of the new Tao Downtown. I actually laughed out loud on the subway a few times it was so bad. From what I read, it seems that the downtown location is even more over the top and overpriced than the uptown one. But still, I couldn't help questioning my choice in post-doc dining. I've thought about it though, and traditions become traditions for a reason. I like Tao, and I like the way I do Tao - I know what to eat, I know what to drink, I know when to go, I know where to sit. 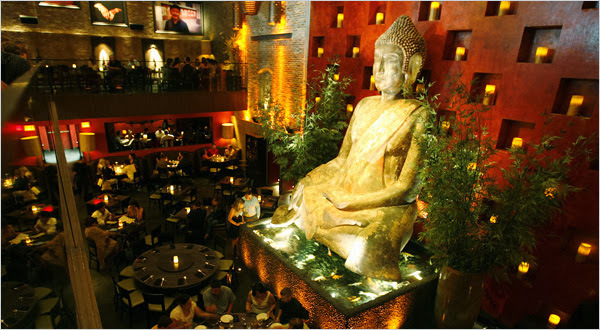 I never really considered going to the new Tao Downtown, didn't think it'd be any different than the first one. But now I'm curious. Could it really be as bad as the review says? According to Sutton (who I trust) I'd be wasting my time, money, and taste buds. Naturally, I want to check it out for myself. Only because I'm a fan of the original. So with that said, we'll see if I find the right night to throw away money on a meal that I will supposedly mostly hate. If and when I do - I'll be sure to tell you all about it here, from my perspective as an unabashed Tao (Uptown) devotee. Until then if you've already been, please, do share!